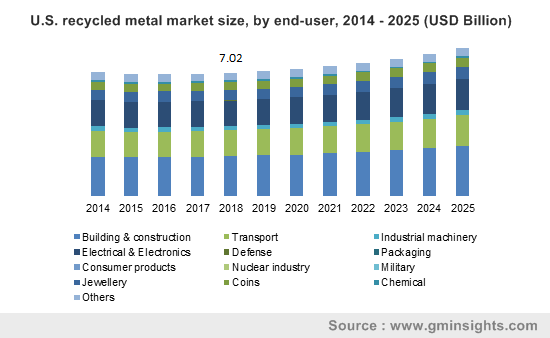 Recycled Metal Market size was over USD 90 billion in 2017 and is projected to expand at over 4.5% CAGR over the forecast timeframe. Strong urbanization & industrialization rate in Asia Pacific and the Middle East is probable to boost its construction industry, which will have subsequent impact on metal demand in the coming years. For instance, Asia Pacific building & construction industry is likley to witness growth of more than 7% in the near future. This is attributed to substantial investment by the regional government in the infrastructure industry to boost its economy. Ferrous and non ferrous metals are widely used in the building & constructions industry. Nearly half of the steel produced globally is used in the building & construction industry. In the Union Budget 2017-2018, approximately USD 55 million has been allotted to the infrastructure plans in India, which will help boost recycled metal demand in the coming years. Additionally, China has been planning to spend USD 2.7 trillion in transportation & infrastructure industry, which will trigger product demand and will have subsequent impact on the recycled metal market size in the coming years. Moreover, stringent legislations formulated by the regional regulatory bodies to enforce metal recycling in order to reduce carbon footprint will have positive impact on the reprocessed metal market size over the projected timeframe. For instance, as per the Chinese industry standard SB/T 11049-2013, it states operation practices of scrap metal recycling company. Furthermore, GB 16487.2-13 standard states environment protection control standards for imported solid wastes as raw materials. The abovementioned trends are likely to make notable contribution to the overall reprocessed metal market size during the forecast timespan. 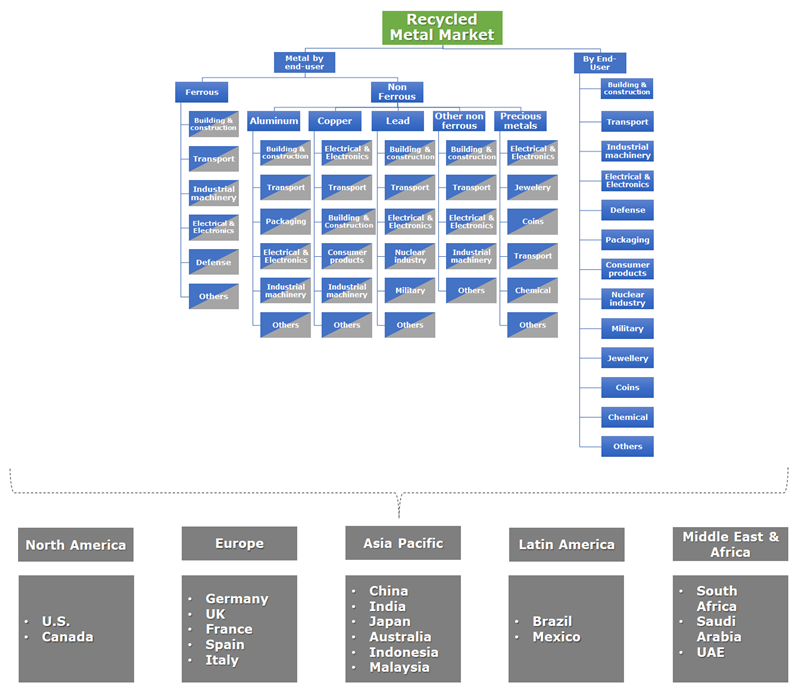 Inefficient recycling process is a major factor which is likely to hamper the overall reprocessed metal market size in the coming years. For instance, ferrous metals recycling constitutes close to 50% of its total production. This is attributed to ineffective recycling process and machinery which are incompetent in attaining ferrous scrap from the total waste generated. However, consistent technology upgradation and rising focus on metal recycling owing to stringent legislations is likely to improve the metal recycling rate which will help attain considerable gains to the overall market in the forecast time spell. In terms of volume, recycled ferrous metal market share constituted approximately 85% of the total industry share in 2017. Ferrous metals include iron & steel which have extensive application across building & construction, transport, industrial machinery, electrical & electronics, defense and various other sectors. Its major application in building & construction is in manufacturing bridges, steel frameworks for buildings, drainage components and other architectural framework as it provides durability, strength, resistance to weather, etc. Rising ferrous metals demand for the abovementioned applications will drive the overall metal demand, which in turn will have positive impact on the recycled metal market size in the forecast timeframe. Recycled metal market share for transport accounted for close to 15% of the global industry share in 2017. This is attributed to wide-ranging metal applications across transportation sector. For instance, ferrous metals are widely applicable in manufacturing automotive, ship, aircraft and marine components owing to its high strength, durability, stiffness, etc. Additionally, non ferrous metals such as lead is widely applicable in the production of batteries which are used in the transportation sector. Strong rise in the transportation sector mainly in the economies such as China, India and Japan will trigger demand for recycled metal which will help drive the overall market share by 2024. Asia Pacific led the overall market and accounted for more than 60% in 2017. Strong regional growth is mainly driven by rapidly growing construction, transportation and electronics industry in the region. This is attributed to rising investment in the mega infrastructure projects mainly in China and India by the regional government to boost country’s economy which will trigger recycled metal demand in the coming years. Moreover, rising socio-economic factors in the region has resulted in rising transportation and electrical & electronics industry. These factors will drive the recycled metal demand and henceforth make noteworthy contribution to the overall reprocessed metal market size in the coming years. Recycled metal market share is highly consolidated as the major players constituted more than 50% of the total industry in 2017. Some of the major processed metal industry players are Nucor Corporation, Aurubis Ag, Steel Dynamics, Novelis, Commercial Metal Company, Sims Metal Management, European Metal Recycling, ELG HanielGmbh and Schnitzer Steel. Most of these players are making substantial investment in forming strategic partnership in order to enhance their overall presence in the industry share. For instance, Sims Metal Management acquired Morley Waste Traders, a leading metal recycler in the UK which resulted in a total ownership of around 50 recycling facilities across UK. Such acquisitions contribute significantly in attaining higher gains in the industry share. Metal recycling involves reprocessing metals without altering its properties. Ferrous metals are among the most recycled metals across the globe. However, other metals such as non ferrous metals (aluminum, copper, lead, precious metals, zinc, nickel, etc.) are also recycled in the market. Recycled metal industry finds wide-ranging applications in building & construction, transportation, electrical & electronics, industrial machinery, defense, military and various other end-user industries. Strong product demand from the building & construction, transportation and electronics industry in Asia Pacific will be a major driving factor for the market size in the coming years. Additionally, stringent regulations and laws imposed by European Commission in Europe to reduce waste generated and its impact on the environment is another major factor which is likely to trigger the market in the coming years.